On December 22, 2018, a continuing resolution passed by Congress to fund a portion of the U.S. Government into the 2019 fiscal year expired and was not renewed resulting in a partial federal government shutdown. Among the affected Executive Departments are the Department of Homeland Security (which includes the Coast Guard and Customs and Border Protection), the Department of Transportation (which includes the Maritime Administration), the Department of Interior (which includes the Bureau of Environment and Enforcement (BSEE) and the Bureau of Ocean Energy Management (BOEM)), and the Federal Maritime Commission. The shutdown is having significant regulatory impacts which will become more severe and then debilitating over time. When appropriations lapse, as they did on December 22, agencies must shutdown operations unless there is an exception. The federal Antideficiency Act prohibits agencies from incurring obligations in the absence of appropriations except where specifically authorized by law (which is the case, for example, with the supplying of troops in the field) or with respect to other excepted activities. Among the most important of these excepted activities are national security activities, activities separately funded, (such as through left-over prior period funding, funding from ongoing fees and funding from unaffected appropriations, such as from the U.S. Department of Defense which has been fully funded), and activities necessary to protect life and property. Federal employees who do not fall into some excepted category are furloughed and cannot perform official functions. Excepted employees are paid to the extent of remaining funds, but then have to work without pay. The partial closure of certain agencies has a negative effect on many industries, including the maritime industry, which is growing over time. In addition to the fact that agencies can no longer contract for services until the shutdown is over, agencies also cannot, in many instances, accept regulatory filings, issue regulatory permissions and approvals, or provide regulatory advice. If the shutdown lasts long enough, the effects could be severe, including the cancellation or postponement of projects, such as offshore wind projects, because of the resulting uncertainty. The Coast Guard indicates that it is still continuing operations authorized by law that provide for national security or that protect life and property, such as search and rescue, port and homeland safety and security, law enforcement, and environmental response activities. However, the Coast Guard has been forced to suspend mission activities that do not fall within those categories. For example, the Coast Guard has been forced to suspend or limit the review and approval of vessel response plans, vessel security plans, shipboard oil pollution emergency plans, and certificates of financial responsibility, all of which are required for U.S. flagged vessels and for foreign flag vessels planning to enter U.S. waters. As a consequence, while the Coast Guard personnel who remain at their desks are working to provide necessary certificates and approvals on a “just-in-time” basis, certain U.S. vessels may not be able to operate, and certain foreign vessels may be unable to deliver their cargoes to the U.S., or may be delayed in making U.S. port calls. 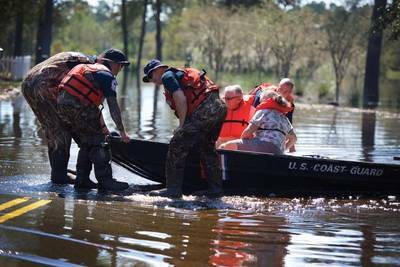 Members of the U.S. Coast Guard’s Gulf Strike Team rescue an elderly couple after floodwaters from the Waccamaw River took over their apartment complex in Horry County, South Carolina, Sept. 19, 2018. As a result of Hurricane Florence, certain rivers flooding from the north continue to pose a threat to communities throughout the Carolinas. 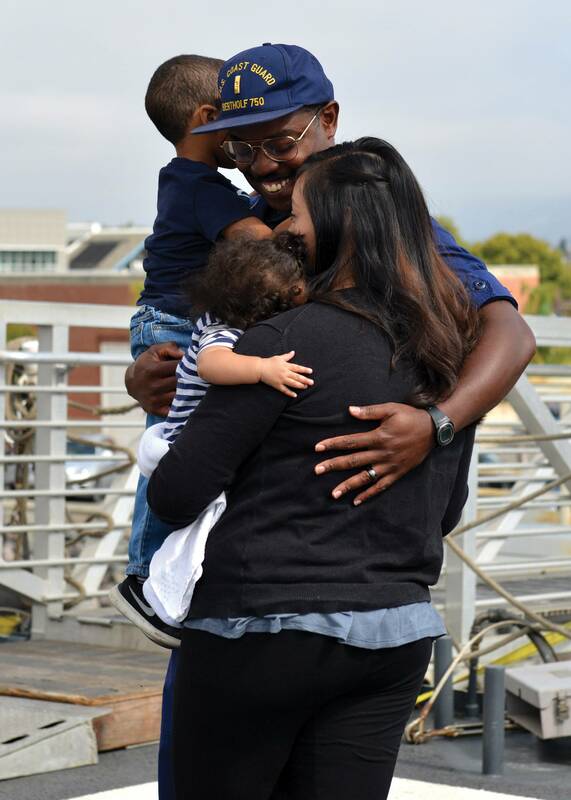 U.S. Coast Guard photo by Petty Officer 1st Class Jon-Paul Rios. The Coast Guard is still carrying out domestic vessel inspections and foreign vessel port state control examinations, but is having to do that work with only uniformed personnel, since the agency is not able to use its civilian marine inspector workforce. That workforce was built up over the past several years in response to recommendations to improve the experience and skill level of the Coast Guard’s marine inspection program. Their absence is leaving a significant gap in the Coast Guard’s ability to manage inspections and port state control activities. In addition, if a marine casualty were to happen during the shutdown, while the Coast Guard’s active duty personnel may be able to start the marine casualty investigation process, their ability to pursue investigations to identify critical safety issues and implement needed actions will be limited. The shutdown is effectively curtailing activities related to vessel construction, sales, repairs, and financing. The Coast Guard is currently unable to carry out legally required vessel plan reviews to ensure that new vessels are built, or existing vessels are repaired or rebuilt, in accordance with Coast Guard and international safety regulations. Persons seeking to purchase and document vessels with the U.S. Coast Guard, or obtain mortgage loans on documented vessels, cannot currently do so. Likewise, lenders and other creditors cannot obtain information about vessel mortgages and liens needed for vessel financing transactions, and cannot record mortgages against vessels to secure loans. The shutdown is also having an impact on the United States’ international maritime interests. The Coast Guard is the lead U.S. representative to the International Maritime Organization, which sets the international laws and regulations governing vessel construction, vessel operations, and pollution prevention. During the shutdown, the agency is not able to carry out the planning and preparation it would otherwise do to represent United States’ interests in the setting and interpretation of international regulations. The longer the shutdown continues, the greater the backlog will be for the currently suspended Coast Guard activities. Once the shutdown ends, persons working with the Coast Guard are likely to see significantly greater response times for plan approvals, processing of vessel transactions, licensing, the payment of claims, and other necessary regulatory actions. MARAD reported that as of January 11, 2019, 466 of its total staff of 740 were excepted and at work with the rest furloughed. About 168 of that 466 total work at the U.S. Merchant Marine Academy and a significant portion of the rest work with respect to the Ready Reserve Force of standby national defense cargo vessels. The Merchant Marine Academy is, however, short staffed with another 86 staff on furlough. MARAD indicates that it will continue to function with respect to its missions in connection with maritime safety of life and property and security of vessels for the U.S. Government during the shutdown but most offices are not fully staffed. Unlike the Coast Guard and MARAD which have maintained substantial but reduced operations, the Federal Maritime Commission (FMC) announced on December 26, 2018 that it would be ceasing all operations until appropriations have been renewed. With the Federal Maritime Commission shuttered indefinitely, the industry may be forced to choose in many cases between foregoing business opportunities or violating the law. For example, carriers cannot comply with requirements that agreements between common carriers, such as space charters, be on file and in effect with the Commission before the common carriers may act under such agreements, and shippers cannot update or enter into new service contracts on file with the Commission if the Commission refuses to accept filings of any kind. Similarly, with the Commission no longer accepting complaints, there will be no forum for shippers, passengers or other consumers to pursue relief under the Shipping Act, effectively suspending enforcement of the Shipping Act until further notice. Regarding common carrier agreements, common carriers may still deliver them to the Commission and take the position that under the Shipping Act, such agreements come into effect 45 days after filing, irrespective of whether the Commission has taken action on them. With respect to service contracts, the Commission’s inability to accept filings may be deemed a “malfunction” of the Commission’s filings system, in which case Commission regulations permit such agreements to come into effect before filing, provided they are actually filed within twenty-four hours of the Commission’s filing systems’ return to service.